Since the election of President Donald J. Trump in 2016, a renewed debate of sorts has emerged – or re-emerged – about the practice of clinical psychologists, psychiatrists, and other mental health professionals (MHPs) diagnosing public figures, such as the President of the United States, celebrities, and the like, with a mental health disorder. Just recently, George Conway, husband of the President’s advisor, Kellyanne Conway, tweeted out snapshots of the definition of several mental health disorders taken from the Diagnostic and Statistical Manual for Mental Disorders (DSM-5) with the implication that Trump may have one or several of these disorders. Conway, a lawyer, is not a practicing clinical psychologist, but his message was clear: Trump has a mental disorder in line with DSM-5 criteria. Was this merely a public relations stunt, or is Conway on to something? 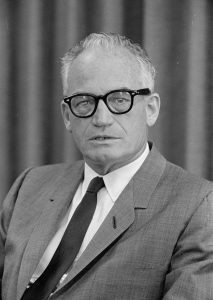 Yet, although the ethical merits of the Goldwater rule remain sound, some psychiatrists have weighed in in the past three years, putting the Goldwater rule against the ethical “duty to warn.” Brandy Lee, cited above, was one such psychiatrist, and she organized a “Duty to Warn” Conference at Yale University in April 2017. Along with 27 other psychiatrists, Lee proceeded to tease out the Goldwater rule vs. the duty to warn question. There still isn’t a clear-cut consensus about how to resolve this ethical conundrum. For example, are public appearances, public statements, and behaviors enough evidence to diagnose a public figure with a mental health disorder? If the answer to this question is “Yes,” does this still risk politicizing the profession? As long as Trump remains in office, questions about the Goldwater rule vs. the duty to warn are going to undoubtedly continue. Lee, B. (2017). The Dangerous Mind of Donald Trump. St. Martin’s Press, New York, NY.